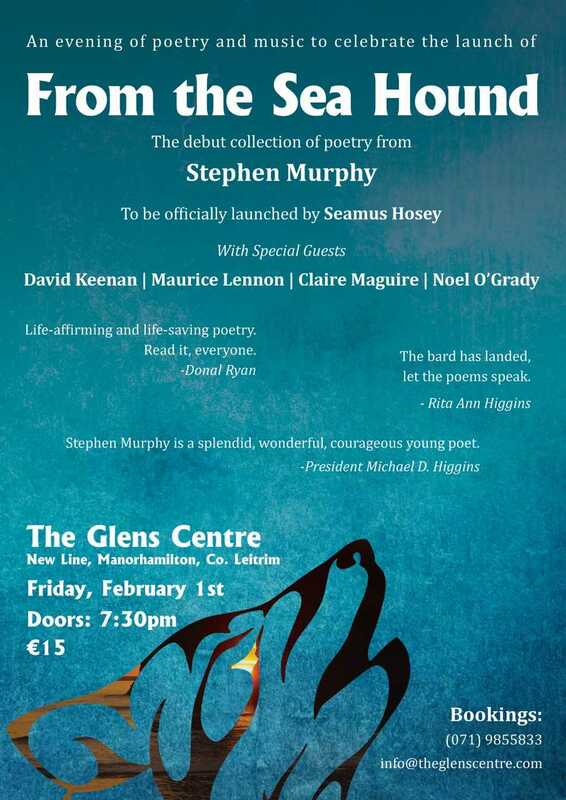 Leitrim's modern new generation poet Stephen Murphy launches his book From the Sea Hound in The Glens Centre, Manorhamilton this Friday, February 1 at 8pm. Supporting him on the night will be an all-star cast including David Keenan, Maurice Lennon, Claire Maguire and Noel O'Grady, while the book will be officially launched by Seamus Hosey. Stephen Murphy has often been called the People's Poet. His work is scathing, controversial, warm and full of insight into the Ireland of today. He tackles the things which matter to us both as individuals and as a nation, and has performed to tens of thousands of people on several occasions. He has featured in the RTE Documentaries A Rebel Act - Poems That Shaped the Nation and Independent’s Day, and has regularly been endorsed by leading figures in Irish cultural and political circles. He has spent many years dedicating himself to his craft, with the express intention of trying to feed light back into the darkness of our world, and his poems have amassed millions of views online. A former All-Ireland slam poetry champion, who has been described by President Michael D. Higgins as "A splendid, wonderful, courageous young poet", he's also the doting father of a beautiful little boy, a very proud Leitrim man, and somebody who believes in the innate magic of the universe around us.